He is so deliciously close to me, I can smell the scent of his shampoo. Dark ends of his hair still clustered and damp. His skin is so invitingly smooth, it looks like he just shaved in a hot shower. Will you believe me when I tell you he looks like a young Johnny Depp? Latin American version. He’s from Argentina. And on a warm winter day, in a dance studio in downtown Buenos Aires, he’s explaining to me and my fellow classmates, how to achieve the best embrace, abrazo, before beginning a tango. And I’m the lucky one he’s chosen to dance with. He aims a remote at the sound system across the room. It begins to play a scratchy recording of an accordion (more precisely, a bandoneón), accompanied by a mournful male voice. It’s like the iPod parked in its dock has morphed into a Victrola. We’re pressed up against one another: his right side and the front of his shoulder angled into the front, left side, of my chest. Draw a line from my heart down: that’s the meridian. His right arm wraps around my side and across the middle of my back, so his hand comes to rest on the right side of my rib cage. No one but a lover would have reason to linger there. Already his palm is generating a slow heat. And the palms of our other hands—the fleshy part, what do the palm readers call it? The Mount of Venus?—they are pressed together and held in midair. He can explain all he wants, but you’ve got to feel what a good embrace is. That’s one of my earlier tango teachers talking. He announced this during a tango seminar about two years before my dance with Señor Depp. Like most women who have given salsa, rhumba and waltz a try, I had assumed Argentine tango worked essentially the same way: he leads, I follow. 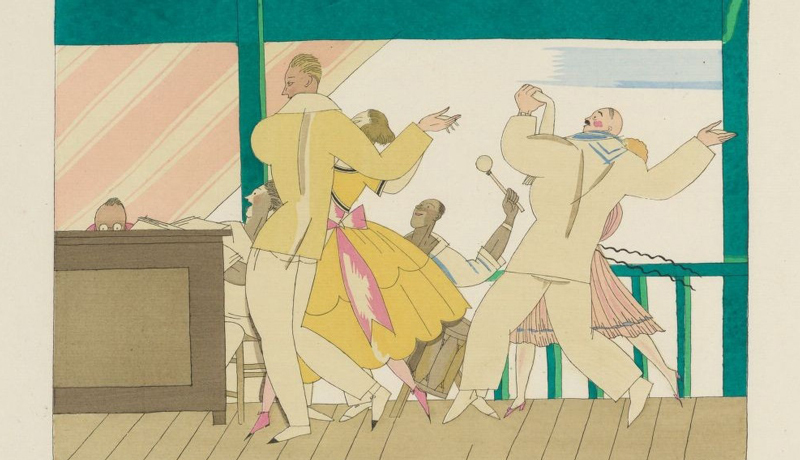 Sure, you can stick to that plan and still get by in tango, but that would be missing the spirit of the whole thing—precisely what made blood flow and pulses race in the Río de la Plata, in the back bars and slums of Buenos Aires and Montevideo, when people began dancing this way on hot summer nights. Tango has come a long way since the 19th century, when the middle and upper classes of Argentina side-stepped it, drawing on, as it does, Cuban and African candombe rhythms—a music and dance style that originated among slave populations. Since then, tango has been embraced around the world. So much so that people like me head for Buenos Aires regularly to learn from teachers who still share the art of these moves. But some describe tango as less dance, more martial art. It’s not a kick-up-your-heels, let-yourself-go kind of good time. Because, when you’re trying to sense in another body, the most subtle shifts in energy and weight and timing and angles, every move or phrase is dictated, but the order of them is improvised. You just don’t know what your partner may choose to do next. In an arena like that, “bringing your dance” is essential. And beautiful. In fact, it’s the only way a tango can work. It really does take two. Things get a little more confusing, though, when you’re decidedly not in the arms of a masterful tango dancer and teacher (who’s already taken note of how you dance, and adapted to it, before taking a single step). That teacher met my gaze. But he didn’t intervene or say a word. He looked at me, and walked on. Maybe he knew my partner didn’t have the skills for that class, but had let him in to balance the number of leaders and followers. Maybe he could see that our struggles were because I was not dancing my part. I don’t know what he was thinking. But what I was thinking was, Why me? I was on the verge of yelling at my partner to get it together. I nearly launched into my teacher for not populating his class more carefully. Instead, I kept working at it and hoped we never got paired again. Fast-forward a couple months, and I’m at a milonga—an organized dance where proper etiquette is observed. And tango etiquette covers a whole host of things, from knowing how to navigate the dance floor (always counterclockwise), to staying on your own axis at all times. You lean together to do the tango, creating a slight A-frame with your partner, but you have to be able to maintain your balance in any situation. Say your partner decides to shift from a “close” embrace to an “open” one, which means less body contact, and therefore less to lean on—your equilibrium has to stay steady, or things fall apart. Fast. So I’m at this milonga, and I’m excited—a frisson of nerves and anticipation. I’m seated on a chair at one of the café tables surrounding the dance floor. Slipping on my red suede, two-and-a-half-inch heels I’d bought on Sarmiento Street in Buenos Aires, I have a keen eye on the door. Oh good: some great leads are showing up. There’s Carlos. There’s David. There’s Chris. The room fills, lights strung along its walls twinkle, shooting small patches of shadow and light across the dance floor. In the near distance, someone pops a cork at the bar. I finish fussing with the buckle on my shoe, sit up, and smooth down my dress. Looking up, I see Peter. Oh, I can’t wait to dance with him. He’s good. I stare intently in his direction, trying to make eye contact, but he’s engaged in conversation. Into my field of vision drifts a guy I know, but don’t know. What I do know is his tango. He’s that guy from class—that guy who hauled me into beginner-land, when I wanted to be all advanced. I accept. The night is young, I say to myself. Let’s warm up. We’re standing on the floor among other couples, as the music begins. His hands are clammy (already? ), and his embrace, tentative. He’s not comfortable, and neither am I. As we “dance” the first tango of the four I’ve committed to with him (part of that tango etiquette), my attention wanders again, like it did when we were partnered before. And just like before, I’m failing to “bring my own dance.” Instead, I’m looking around the room, clocking where Peter and Chris and Carlos are. As soon as I can finish my tangos with this guy, the faster I can dance with those other leads. My partner has steered me perilously close to another couple, and her heel comes down on the top of my foot. Now I’m irritated. My body tenses. My lead’s left palm grows even sweatier. Is he holding his breath? Why can’t he just relax? Why can’t he get into the music? It feels as though we’re dancing through wet cement. Three more tangos, I tell myself. But the prospect of dancing three more tangos feels like an eternity. I start to calculate how many more dances remain available to me this night. I want this tanda, this set of dances, to be over with. Now. Then I remember how many nights I’ve been in this very situation. Oh sure, I’ve experienced some sublime tangos. The ones where I’m reading my partner and he’s reading me, and our timing is right on the money, and the music is fantastic, and he’s introducing moves I didn’t even know my body knew the answer to, and all is right with the world. It’s the promise of that kind of tango that has kept me going back to lessons, and milongas and Argentina, for years. The vast majority are more like trying to chisel, coax, tease something halfway artful, out of thin air. Often with a person you’ve never danced with before. But if you’re both focused—hearing the music, feeling the floor, sensing your partner—there is hope. Mr. Beginner grips me, trying to make something of this dance. He is trying. Meanwhile, I am battling my own confusion and frustration: If I’m not leading this dance, how can I actually make it better? I can’t choose for him the best steps. I can’t fix anybody’s embrace. I can’t make his body feel the music. I can take a step. I can take one simple step, and try to make it the best I’ve ever done. From the outside, if anyone noticed at all, I’m sure it looked like the most ordinary of gestures. It was one simple step backward, in time with the music I have tangoed to countless times. I’m sure no one noticed what happened next, either. Tracy Picha is a writer based in Halifax, Nova Scotia, Canada. She’s currently part of a team working on a documentary project called When You Die (whenyoudie.org). Find more of her published work at tracyinprint.tumblr.com. This piece was first published in Mindful magazine, February 2014. Featured Artwork: Illustration from Sports & divertisements, 1914, a collaborative art and music project by Charles Martin (1884-1934) and Erik Satie (1866-1925). Houghton Typ 915.14.7700, Houghton Library, Harvard University.